It’s been slow for the past week or so – I’ve been busy with school, a bit of traveling, and the like. Anyhow, last weekend S and I went to downtown Raleigh to see James Cameron’s Avatar in IMAX 3-D, and before the movie, we decided to have dinner at 518 West. Now, some of you guys are going to have to help me out here, but is 518 West related to 411 West on Franklin St at all? 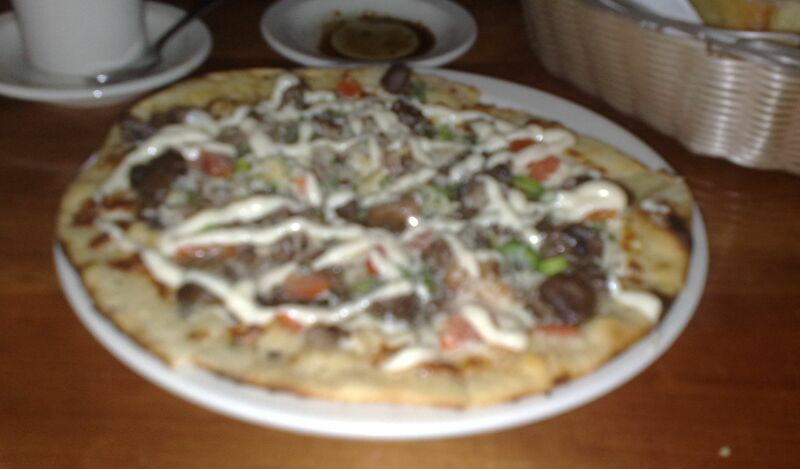 Just curious..
We shared a pizzette (9″), the beef tenderloin with mushrooms, romas, scallions, mozzarella, romano, and oregano, and drizzled with horseradish sauce. To be honest, there was so much stuff going on that all the flavors were a little lost on me.. especially the horseradish sauce. In fact, we thought it was mayonnaise for most of the evening, and it made the taste so heavy that I scraped it off after the first slice. 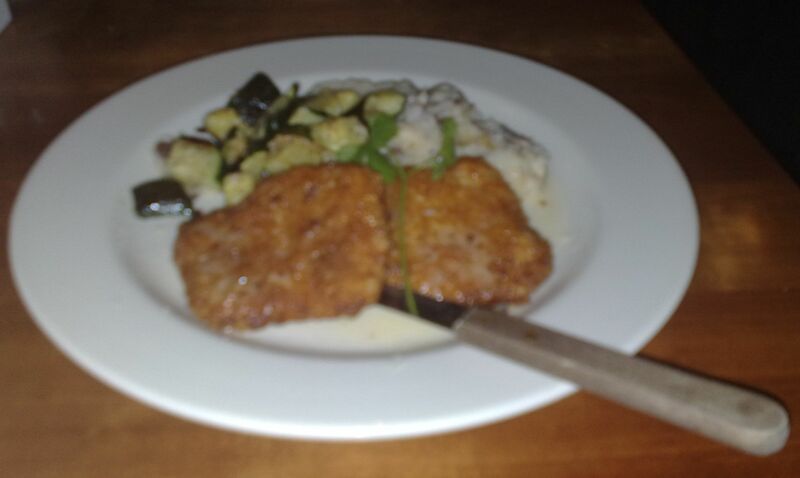 I also ordered an entree (not sure why, I suppose I didn’t realize how big the pizzette was), the Pork Loin Milanese, which is a breaded and fried pork cutlet served over mashed potatoes, with grilled vegetables. It reminded me a lot of the pork cutlet from Japanese-style fried pork cutlet, actually.. and it was fried very nicely. The mashed potatoes were not too memorable other than the fact that they were also very heavy. A long time ago, 518 was to me a high end establishment. It’s got a nice interior (but horrible parking) and it seemed classy.. I was also probably in my freshman year of college. After eating in a few other places around the Triangle, it’s only mediocre at best. Yes 518 and 411 are owned by the same people and if you look at their website, the same people own Mez in Cary/Morrisville. All the food at these places seems just okay.